Beginning by finding the funding for the building that continues to be the cores of the institution, including the glorious Jordan Hall, in which Wednesday night’s NECS concert took place, Chadwick was the greatest thing ever to happen to NEC, but in some ways NEC was the worst thing ever to happen to Chadwick. More on that later. The concert, which culminated with one of Chadwick’s most significant pieces, began with two slyly programmed works by German Romantic masters, of which the first was Brahms’s Academic Festival Overture, op. 80 (1880), substituting for the originally announced Tragic Overture, op. 81. Though it would have been nice to hear the less often played Tragic, the substitution was warranted on grounds of tone and the overture’s witty yet recherché “academic” construction out of traditional collegiate drinking songs (perhaps a bit of a nose-tweak to academe by the learned but autodidact Brahms). We don’t know when Loebel decided to make the change, but of the three items on the agenda the reading of the Brahms, though properly boisterous where it needed to be, suffered as the roughest and least refined, in terms of phrasing, dynamics and balance (the winds were rather often covered), suggesting inadequate rehearsal. The next offering was the standard coupling of the Prelude and Love-Death (Liebestod) from Wagner’s Tristan und Isolde (1859). The revolutionary sinuousness and chromaticism of this music of yearning and surcease-in-death represents the apotheosis of the appoggiatura and ends with the hardest-won major chord in music history. A gobsmacked European musical society experienced a holy war that lasted over a hundred years, until around 1980, when composers tacitly agreed not to get all teleological about style. At any rate it became the problem of late 19th century composers, especially those like Americans who were more or less innocent bystanders, to reconcile these opposing camps. Chadwick was one who took on this challenge, though moreso in his subsequent symphonic offering. Loebel and the NECS players acquitted themselves much better in the Wagner than in the Brahms. Lines were clear, phrasing, pacing and dynamics were all well judged, and each part could be heard, notably the fine playing of Cheyanne Duran on English horn. So back we come to Chadwick, whose Symphony No. 2 in B-flat major, op. 21 (1885) concluded the evening. Having neglected to provide program notes, and having gotten Chadwick’s dates wrong therein (for the record: 1854-1931), Loebel took the microphone to offer something of an apologia. After a historical recitation, Loebel turned to a discussion of the symphony and Chadwick’s place in music, and in the process fatally undercut what should have been a revelatory appreciation with remarks of such patronizing backhandedness that they left us agape. 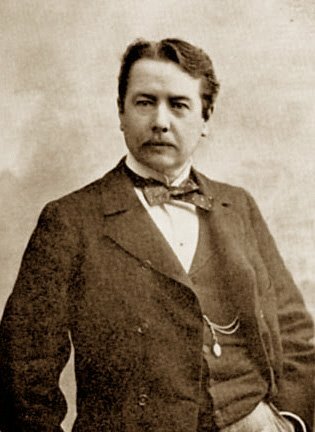 Noting that Chadwick trained in Germany (he studied with Jadassohn in Leipzig and Rheinberger in Munich), Loebel rehearsed the third-hand opinions that, “spirit” aside, there was nothing much particularly American in Chadwick’s output, and compared it to “a minor work of Dvořák or a major work of one of Dvořák’s minor contemporaries.” Observing that the symphony was performed by the BSO in 1885 and “later” in 1891, both before Symphony Hall was built, Loebel averred that while Chadwick’s symphony might not be “at home in Symphony Hall” it was clearly so in Jordan Hall. Well, that puts Chadwick in his place, no? No. This is the kind of abuse heaped upon Ives 30 to 40 years ago. More astute observers like Hugo Cole, writing as long ago as 1980 in the Grove’s Dictionary (a venue not always friendly to American composers), acknowledge Chadwick as “freeing American musical expression from German conservatory style” and having incorporated distinctive Americanisms into his Second Symphony (a signature characteristic of his music was the use of pentatonic melodies, in the style of English and Irish folk tunes: the main theme of the first movement is such a melody; and there’s a clear invocation of Stephen Foster’s O Dem Golden Slippers in the second theme of the finale). Not only that, but, in a very bold move indeed for someone looking to make a big impression after only a few years back in the country, Chadwick’s symphony contains not just high spirits, organizational rigor (a unifying motif of a rising fourth or fifth in all movements, plus lots of lightly worn contrapuntal learning like that of Brahms), brilliant orchestration, and dry Yankee wit (the reviewer of the premiere said of the scherzo “it positively winks at you”), but an actual, palpable joke: The second subject of the first movement is such a regular, foursquare 16-bar tune, rather like a popular ballad or waltz, that three-quarters of the way through it, Chadwick effectively says “you know how this is going to end, so I don’t need to bother writing it out,” and concludes with a few pizzicato strings to outline the rhythm. Not since Haydn’s Surprise Symphony has there been anything this hilarious in “serious” music—a point not lost on Ives, who greatly admired Chadwick. We could go on at even greater length, but we’ll just say here that the NECS performance of the Chadwick was essentially excellent, although its jollity was often taken as high-volume mania (rather than winking, the scherzo buttonholed you and laughed in your face), and some phrases rushed that could have been better articulated (like that first theme). Chadwick’s brilliant writing for winds and brass met with superb results from the players, and we are at pains to shout out (if the program is reliable) to Thomas Ossi, horn, Jensen Bocco, bassoon, David Norville, oboe, and Maxwell VeRost, trumpet). So why was NEC such a bad thing for Chadwick? Because, as in the sad case of William Sterndale Bennett—so highly regarded as a young man by Mendelssohn and Schumann—the burdens of administration kept a lid on his creative output; his catalogue is not nearly as extensive as someone of his manifest gifts ought to have produced. That Chadwick was, nevertheless, the greatest American composer before Ives is inarguable, especially considering that nobody had heard Ives’s music until the 1920s. Not only does his Second Symphony belong in Symphony Hall, it belongs in every concert hall (and for good measure there should be a statue of him in his native Lowell). Don’t just take our word for it (not that you would): listen to the splendid recording by the Detroit Symphony under Neemi Järvi. It’s interesting that the conductor’s remarks seem to indicate that he doesn’t have a very high opinion of the piece he is about to conduct. Chadwick’s Third Symphony was played in Symphony Hall by the BSO about fifteen years ago, and it was certainly “at home” there. Question: Did Stephen Foster really write “O Dem Golden Slippers”? Thanks to George Hungerford for picking up on that error. Correct attribution is James A. Bland, according to the Wikipedia oracle. My bad for running with a faulty memory.